From Texas's Charlie Strong to LSU's Les Miles to Nebraska's Mike Riley, there are a number of college football coaches who enter 2016 on the hot seat. Which ones are most in need of successful seasons? The pressure to get results has never been higher or more immediate for college football coaches. Those who enter the 2016 season on the hot seat can’t even count on having a full 12 games to produce. Twelve coaches last year were out of their jobs before the end of the regular season. It’s a harsh reminder that the coaching carousel never stops spinning. After a massive shakeup that led to 29 coaching changes, which coaches will be scrutinized extra closely this season? Here’s SI.com’s look at which coaches enter 2016 on the hot seat. Will Texas have patience with Strong? He’s won only 11 games in two seasons leading the Longhorns, and it’s hard to imagine him surviving another sub-.500 campaign. To make matters worse, Texas has been thoroughly outperformed of late by in-state foes Baylor and TCU, who aren’t exactly as tradition-rich as the Longhorns. Strong better hope his team finally puts it together on the offensive side of the ball this season. His job likely depends on it. Miles’s seat isn’t as hot as it was at the end of last season, when he was all but fired in a bizarre saga that ended with his return. But make no mistake: The feel good vibes will vanish quickly if the Tigers fail to make noise in the SEC. For Miles, his job comes down to the unfortunate task of having to beat Alabama. LSU has lost five in a row to the Crimson Tide, its longest losing streak to the Crimson Tide since 1981. Miles almost certainly won’t be given a chance to make it seven, so he needs to keep it from hitting six this fall. With Leonard Fournette in the backfield and a veteran defense, the Mad Hatter will need to find a way to get his team into College Football Playoff contention. Hazell has gone 6–30 in three seasons at Purdue. This may not be the most attractive job to prospective hires, but with Big Ten money, it can pay. So don’t expect Hazell to slide by simply because there are no better options. He needs to win, and he needs to win quickly. Sumlin is probably helped to a degree by his contract, which owes him a guaranteed $5 million per year through 2019. Once the hottest name in coaching, often drawing NFL speculation, Sumlin now finds himself on the hot seat due to back-to-back 8–5 seasons following the departure of Johnny Manziel. Sumlin is lucky to have graduate transfer Trevor Knight at quarterback this season, a veteran presence who can make up for in experience what the Aggies have lost at the position to transfer. Still, unless Sumlin and Knight can stop the Aggies’ slide, Texas A&M may have few qualms about eating the remaining money on Sumlin’s deal. Back-to-back 5–7 seasons and a 12–24 overall record for Stoops do not bode well for his future. The Wildcats are not expected to be a football powerhouse, but Kentucky gave Stoops a big contract and new facilities to keep the team competitive. Another sub-.500 year could be the final straw. Malzahn’s genius seemingly ran out last season, as the Tigers offense hardly resembled a unit of sophistication. In coaching, what got you hired will get you fired. 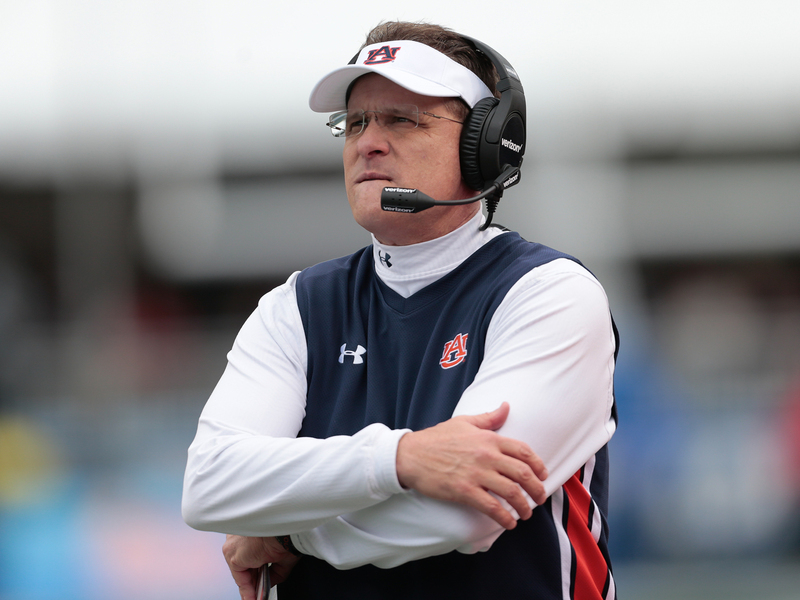 Malzahn is 2–10 in his last 12 SEC contests, and if his offense can’t perform, his past success won’t save him. Like some of the other big names in the SEC, Malzahn needs a bounce-back season in the worst way. Holgorsen is coaching for an athletic director (Shane Lyons) who did not hire him and a contract that expires after next season. It’s simple, Holgorsen is in a prove-it season. The Mountaineers’ switch from the Big East to the Big 12 was no cakewalk, making Holgorsen’s life even tougher. The coach will now need to have one of the best years of his career to save his job. Claeys has coached only six games since taking over for Jerry Kill, who had to step away from coaching due to health concerns. Claeys is coaching on a contract that runs through 2018, which makes him seem like more of a glorified interim coach at this point in time. With the Gophers undergoing some changes in the athletic department, Claeys could be let go if he doesn’t keep the program’s momentum moving forward. MacIntyre inherited a bit of a mess in Colorado, so he was never expected to win big right away. But he also has a conference record of 2–25 and a string of last-place finishes in the Pac-12 South. The Buffaloes were more competitive last season than their record would suggest, but MacIntyre may not get another year if they struggle again. Mason has failed to maintain the hype the departed James Franklin brought to Vandy. Franklin raised expectations for the Commodores, and Mason hasn’t met them. This year could be bowl game or bust for Mason, who has a 2–14 career record in the SEC. Clawson’s plodding Demon Deacons have won only six games in two years. The only thing working in Clawson’s favor at this point is his experience—in his three other head coaching jobs, those teams also started very slow before making big gains by season three or four. Clawson will need to show that he can work his turnaround magic for a fourth time. Addazio’s Eagles went from two straight 7–6 seasons to 3–9 last year. Addazio is now coaching to prove last season was an aberration, and not his first two. The coaching hire some thought was a downgrade when it happened could turn out to be just that. Riley took a Cornhuskers team that consistently won nine to ten games under Bo Pelini and won only six last season. If Nebraska is willing to admit it made a mistake, Riley could be gone after another average campaign. I know, I know, just hear me out. Helton wasn’t hired by new athletic director Lynn Swann. USC has been a little erratic when it comes to coaching hires the past few seasons. And things haven't exactly gone swimmingly since Helton got his interim tag removed late last season—the Trojans are 0–2 since, losing the Pac-12 championship game and the Holiday Bowl. The Trojans aren’t patient, and I think they’ll go after a big name if Helton has a disastrous season.